Sealife was ordered in 1996 from the Cantiere Nautico VZ dockyards in Northern Italy. The boat model is VZ18 and in total she took 18 months to build. Her original owners drove her up to Sweden in 1997. We took over ownership of this beautiful boat in 2016 and directly began renovating with a new kitchen, carpeting, heating system etc. Our intention was to get her ready for our guests and she is now fully prepared to welcome you on board. Size: 62 foot (18,5 meter) long och 5,35 wide. Motors: 2 MAN diesel motors at approx. ca 820 hk per motor. 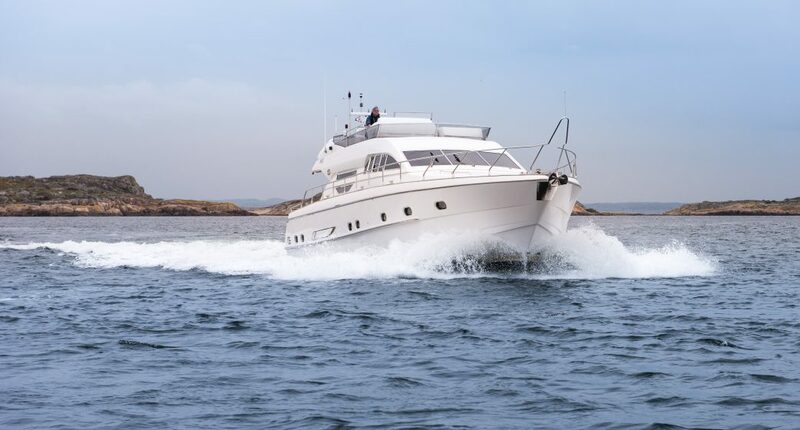 Speed: Max speed 28 knop, cruising speed 17 knop och charter speed 10 knop. Number of guests: 12 guests for daytrips and 6 overnight guests. Cabins: 3 double cabins in the bow each with a private ensuite. One of these cabins is slightly larger; being the boats’ master cabin. There are also three beds in the stern and here is also a bathroom with shower and toilet. The salon has room for 7-8 guests seated in the sofas and just outside of the kitchen there is seating for another 4 guests. The flybridge also takes 12 seated guests, offering beautiful views of the surroundings. On sunny days we cover the deck to protect from the sun’s rays and even perhaps the odd drop of rain. On the stern deck we set the table for 12 people. From here it is also possible to take the starboard stairs down to the swimming platform. The stern deck is completely undercover and side covers can also be put up to shelter from the sea breeze. Wifi is available on board and there is a large TV which can easily be used as a conference screen.